Kyle Kaspar, left, and Tiffany Fisher became the Shiner Comanches' first state tennis champions after winning the Class 1A state mixed doubles title. The duo was named the Advocate's Athletes of the Week for their accomplishment. 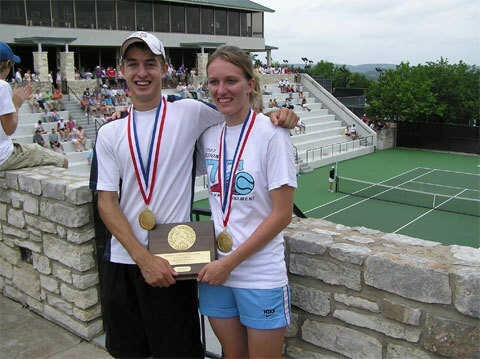 When Shiner tennis coach Jo Ann Muehlstein paired Kyle Kaspar and Tiffany Fisher together as a mixed doubles team, she did so knowing they were two of the best players to play for the school in a long time. Now she knows the two are among the best in the state after they won the Class 1A mixed doubles state championship last week in Austin. Kaspar and Fisher came away with the title after a dominating 6-2, 6-1 win over Lana Rothe and Isaiah Lopez from D'Hanis, a feat that also earned them the title of Advocate Athletes of the Week. The two said their championship match was more difficult than the final results indicate. "In the first couple of games it was really hard to get a couple of points on them," Fisher said. "After that, I think we got their spirits down and we started scoring point after point." The win gave the team the title, but they still are having difficulties getting used to the fact they are the champs. "It's hard to really realize that we're state champions," Kaspar said, chuckling just at saying state champions. "It hasn't sunk in yet," Fisher said. "I'm still on my cloud." This was the first year for Kaspar and Fisher to team together, but each was very familiar with the other's abilities. "Even last year they were the best players that I had, but they didn't get along very well," Muehlstein said. "They've been very competitive since junior high because there was no one in their grade that played at their level. "They would often play against each other, so we decided to turn that competitiveness around and have them compete against other teams." But not all of that rivalry went away, of course. "We still competed against each other," Kaspar said. "It gave us that extra drive," Fisher added. The pair pushed each other all the way to the state tournament, where they said they really developed as a team. "Our chemistry really came together at state," Kaspar said. "I think mainly team communication improved." "We were really playing as a team," Fisher said. "We could read each other's moves and know where we were going." Now that she knows where her team ranks in the state, Muehlstein isn't shy about saying where she thinks Kaspar and Fisher rank in the recent history of Shiner tennis. "They're easily the best," Muehlstein said. "Tiffany went to regional. Before that, it's been nine years since anyone from Shiner has been to regional. It's been more like 25 or 30 years since anyone went to state." The city, known more as a football town, showed their appreciation for the pair as well. "It was really neat," Kaspar said. "We got to ride the fire truck through town, which was very special. The Shiner people have really supported us." Fisher and Kaspar were also honored at the Shiner sports banquet on Monday. They received a standing ovation when they were announced. The duo is taking time to enjoy their championship, but there is already another goal on the horizon. Both Kaspar and Fisher are juniors this year and are already think of a repeat performance next year. "We've just got to play next year like we're not state champions," Kaspar said. "We have to play hard and be hungry for it." Billy Mau is a sports writer for the Victoria Advocate. Contact him at 361-580-6538 or by e-mail at bmau@vicad.com. CONGRATULATIONS KYLE & TIFFANY !